Hanging Kote himo is not allowed. It might cause danger or uncomfortable grip. 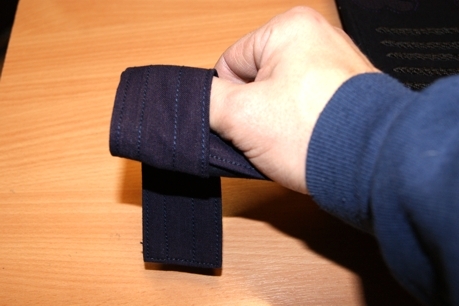 Adjust Kote so there is air 1-2cm between your wrist and Kote Bu (hitting part of Kote). 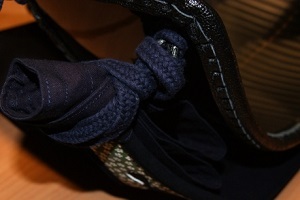 All extra Himo you can stuff between Kote Himo loops and holes. This will hold them securely and firmly. 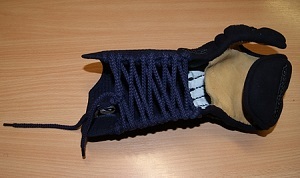 They wont stugg on anything or they wont be between Kote palm leather and your hand. 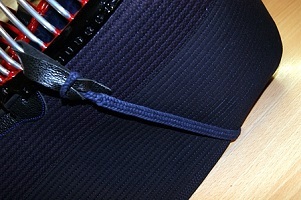 You will have 2 piece of 7 shaku Himo for Men and 2 piece of leather Chichikawa attaching the Himos to Men. 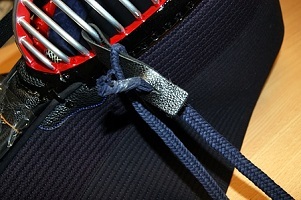 KANSAI STYLE: Alternavly you can have 2 piece of 8 shaku Men Himo and 1 piece of leather Chichikawa for upper attachment for the Himos to Men. 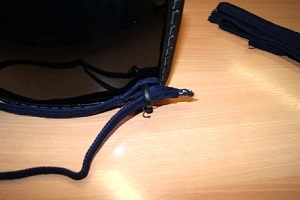 Men Himos’ other end has loop and other end has loose thread ends. 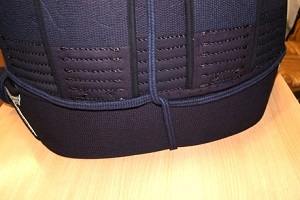 Chichikawa has 1 hole in each end. 1.Place the chichikawa to 4 metal bar from down of the Men gane. If your Men is junior size use 3rd bar. Put the Chichikawas ends to the side ot the Men (left and right). 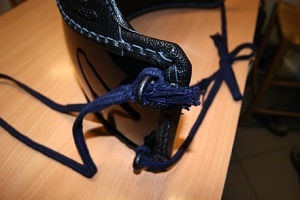 2.Put the Himo on so the Chichikawa ends will go thru loop. 3. 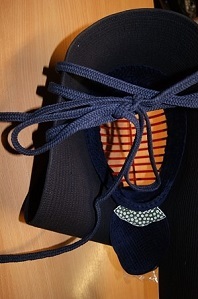 You can use some tape to make Himo loose ends like a cone. Put the cone thru the holes of the Chichikawa from the side between Men and Chichikawa. 4. Pull the Men Himo all the way thru the Chichikawa and turn the Himo behind of the Men. 5. Circle around the Men to the other side and put the cone end under the gane’s top vertical bar. 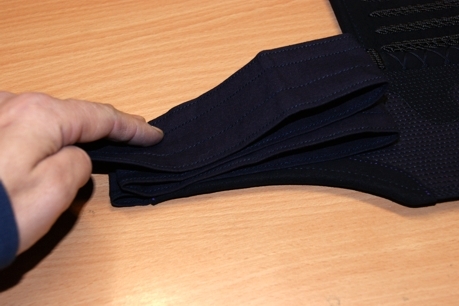 You can fold the Men Himo for easy and fast pull thru. 6. Pull the Men Himo all the way thru and turn it behind the Men. 7. Follow the same instructions to the other side with mirror image. 8. After both Men Himos are behind Men make a knot. 9. 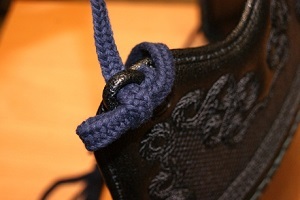 Pull the knot loops so the Men Himo ends will be same level then knot loops ends. This should be maximum 40cm when wearing the Men. Cut the Men Himo if needed. 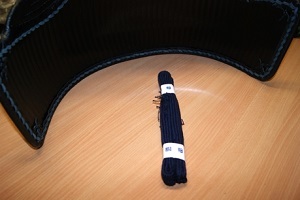 Make new loose ends –> open ends for 3-5cm, take atleast 2 threads and pull them thru in middle of first solid crossing of Men Himo and wrap around, make a tight knot. 10.1. Pull the Men Tare from back to front. The Men Tare should cover collar bones and shoulder muscles for thrusts and hits. Always store Men so Men Tare wont bend upward and make it unsafe for thrusts and hits. 10.2. Open the ears by pulling the Men Tare from behind. If ears is covered too firmly by Men a hit to the side of Men might cause damage to the ears by air pressure. 10.3. Keep the Men himo behind the Men and always follow that your opponent Men Himo is not in front. 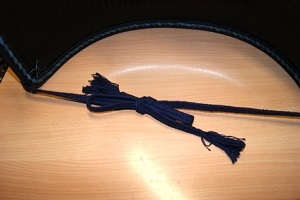 Shinai might go in to the loops of Men Himo and sudden swing might cause neck injury. 10.4. 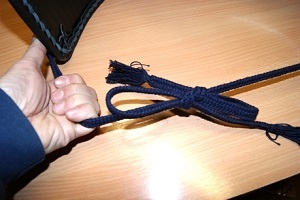 Thighten the knot by pulling the loops with short firm pull twice. 1. Put the Tenugui on floor. 2. 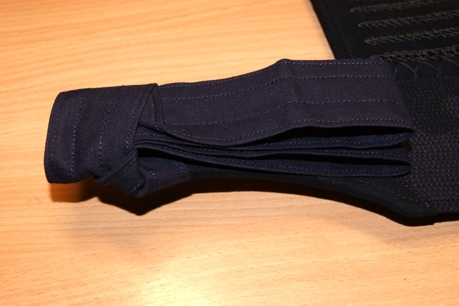 Fold it in middle horizontaly. 3. 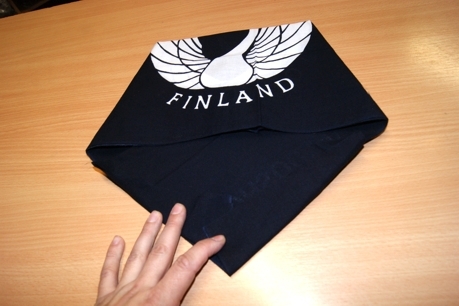 Fold it from each sides leaving ca. 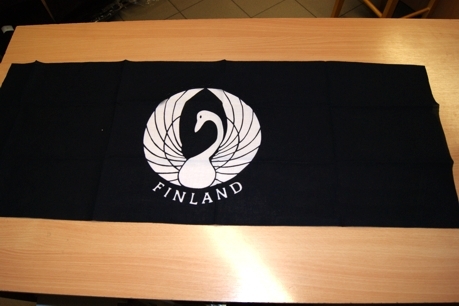 25cm in middle and turn the ends downwards crossing each other. 4. Turn The Tenugui upside down. 9. 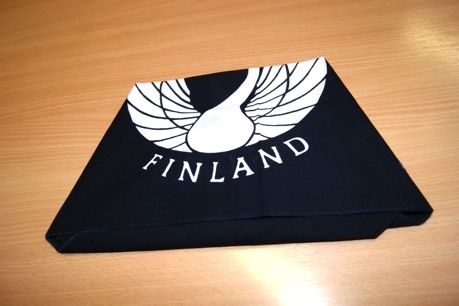 This is very easy way to wear Tenugui and it covers forehead and ears. 1. 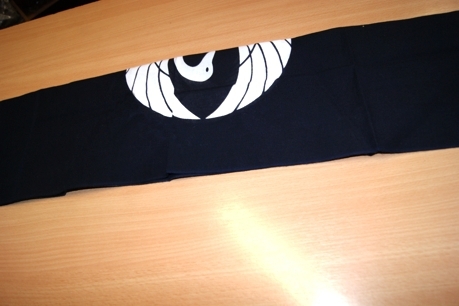 Hold the Tenugui in front of eyes so you can read it. 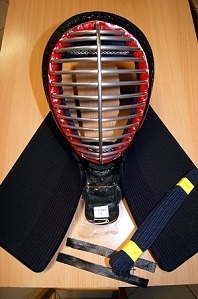 There might be some wisdom which is vital to understand Do in Kendo. 3. Pull it back while keeping it firmly against your skull. 4. 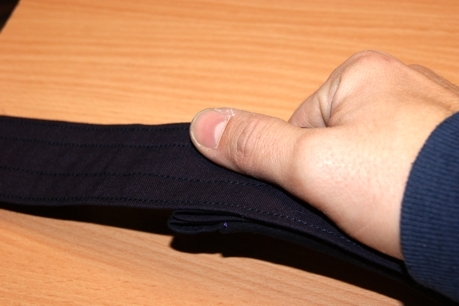 Place the right side around your forehead to the left side. Make it firmly and thightly. 5. Place the left side over the right side around the forehead to the right side. Make it firmly and thightly. 6. Release the right hand. 7. Pull the hanging triangle in front of your eyes over the top of head. Make it firmly and thightly. 9. 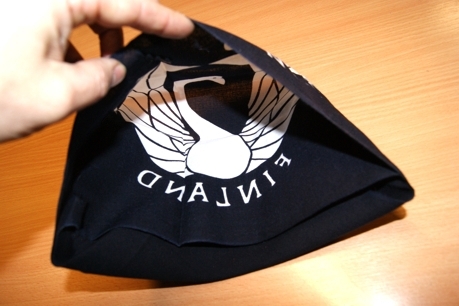 Fold the triangle inside so it wont flap around while practising. 10. 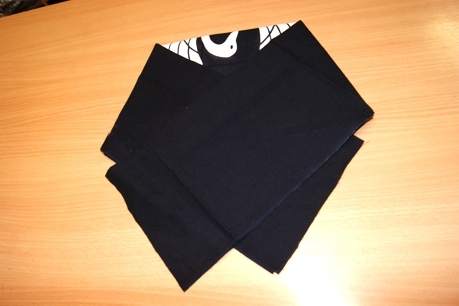 You can adjust the Tenugui in proper place. Make sure it is firm and thight. 1. Take the Men Himo to left hand. 2. 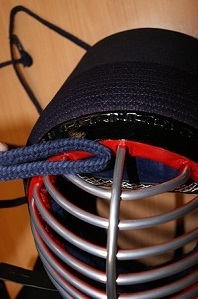 Release the Himo so your head is able to enter in to the Men. 3. Lift the Men up with right hand and place the left hand under gane. 5. Make sure that the Men Himo is behind your head crossing your backhead. 8. Turn Himos behind your head under the crossing of the Himos. Make it firmly and thightly. 10. 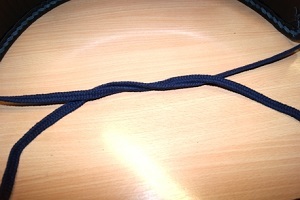 Make a knot sideways. 11. 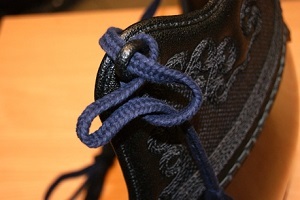 Pull the knot loops and simultaneously keep the Himo ends in hand. 12. Make the loops and end same level. 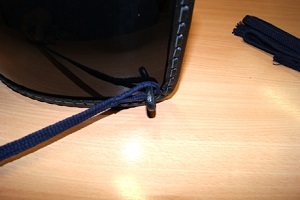 Maximum 40cm from the knot. 13. 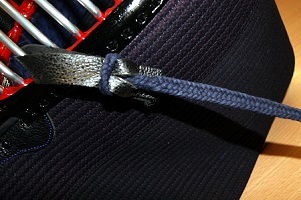 Thighten the know by pulling the loops with short and firm pull twice. 14. 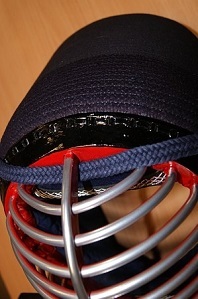 Release the air pressure from ears to avoid any ear insure from side hits. 15. Pull the Men Tare front and down to cover collar bones from any thrust or hits. 5. Dont push the Kote from the hand. Always pull from Kote Bu (hitting target part). 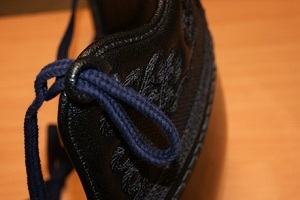 Proper wearing will save the Kote from damage and make it in proper shape for movement. 6. 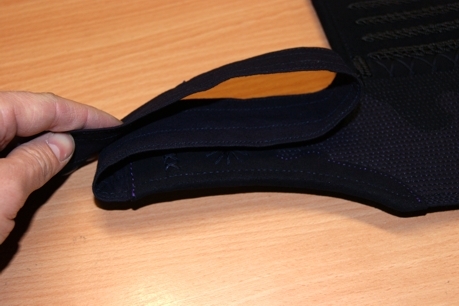 You can massage palms together or press palm leather with thumbs to make it soft and even surface. 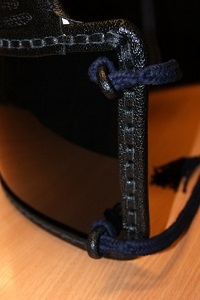 Any folds on leather increase the wearness. 7. 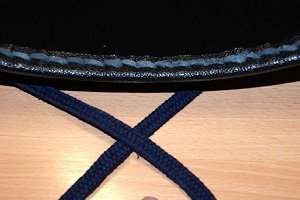 After each practise try to remove any folds on Kote palm leathers. 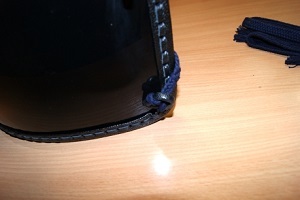 Dry folded palm leather is damaged easily. 8. Take your Kote off by pulling it from hand. Dont push from Kote Bu. Take first right hand and then left hand. 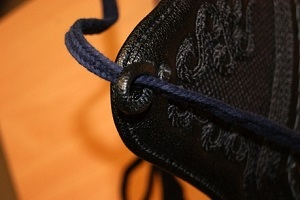 Place the Kote in front of you open to the left and hand end to the right. 9. Place the Men on Kote. Make sure that you dont have to bow while placing the Men over Kote. After Tenugui is on Men or inside of Men take the Men with left hand and Kote with right hand moving them right upward in front of you. You will have 4 piece of Do Himos for Bogu. 2 piece is longer and 2 shorter. The shorter ones you place down to the side of Do. 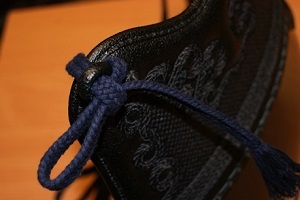 Attach them to Do to the leather loops (Do Yoko Chichikawa). 1. 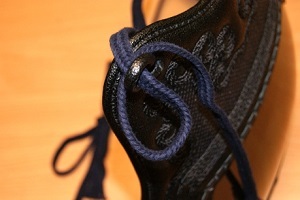 Place the shorter Himo from loop around Do Yoko Chichikawa. 2. Make a cone with tape from the loose end of Himo. 3. Push the cone thru Do Yoko Chichikawa from front side to back side. 4. Turn the himo behind the Do. 5. Follow same to the other side with mirror image. 6. 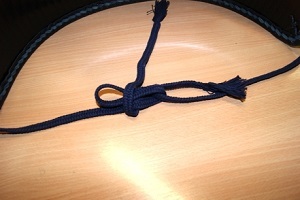 Make a knot sideway when wearing the Do by turnign the first knot loop for the side where the Himo comes. 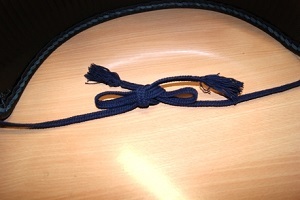 By turning over other Himo and pointing up you will end up vertical knot which is not allowed. 7. 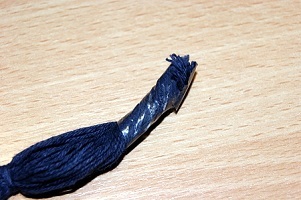 You thighten the knot by pulling the Himos to each sides from the point just after attachment to the Do. 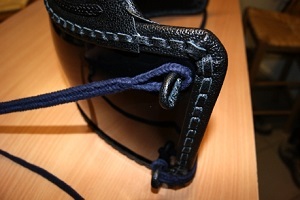 This is important so your Do wont be loose and dangerous during practise or competitions. 8. 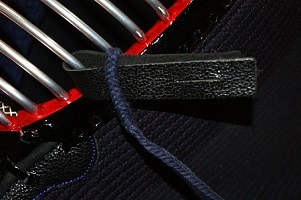 Attach the upper Himos to the upper Do Yoko Chichikawas similary. 9. 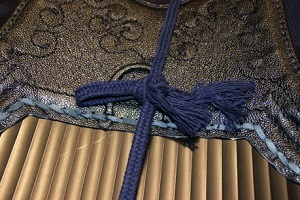 Turn the himos back and cross them to each other until to the upper Do Chichikawas in Mune (upper leather part of Do in chest) part. 10. 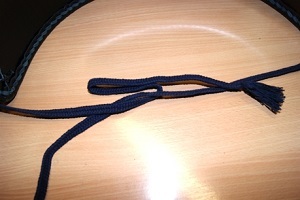 Make a knot when wearing the Do by pushins the Do Himo all the way thru Do Mune Chichikawas. 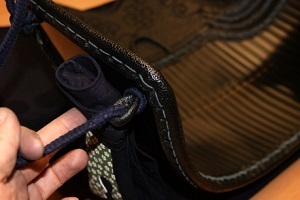 Wrap around the Chichikawa and place a finger to make a hole for the Himo to go thru. 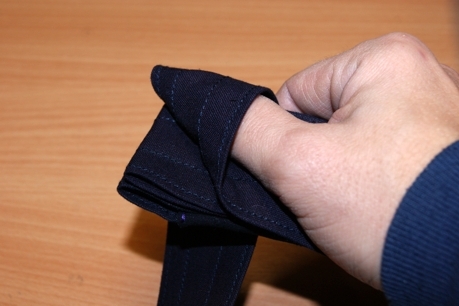 Fold the Himo and push the folded Himo to the Himo loop. Thighten the Himo by pulling it. 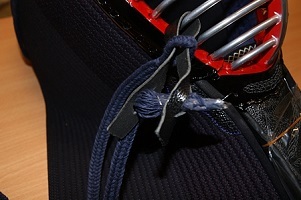 Push the loose end of the Himo behind the Mune part. 10.1 Remember to adjust the loops sideways and make the small. Shinai might caught to Do Himo loops and end up injuring both players. 11. 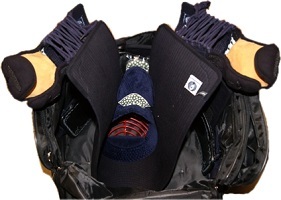 The proper height of the Do is easy to reach by wearing th Do on sitting position (Seiza). After you stand up the Do bottom line should be in middle of the Tare Himo (Tare Himo will show 2-4cm under Do). If all Tare is shown is Do too high. If you can not see Tare Himo is Do too low. 1. 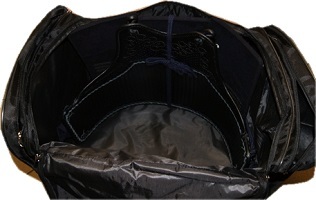 Tare wrapping is done in knee position, Tare front side up and Tare on lap. 2. 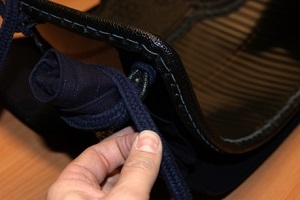 Start wrapping by folding the Tare Himo the length of Tare flap outside. 3. 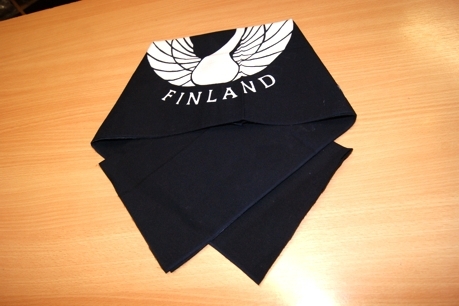 Fold Himo 4 times. 4. Place your opposite hand thumb on Himo and hold Tare. 5. Roll the rest of Himo over the thumb. 6. Make it two times if needed. 7. 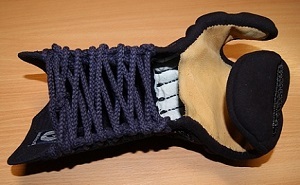 Replace the thumb with end of the Himo. 8. Ready and make same to the other Himo. 10. Wrap the short Himo of Do around the wrapped Tare Himo two times. 11. And the end of Himo around itself. Repeat to the other side. 12. Take the longer Do Himos and cross them under the Tare. Like Christmas wrap. 13. Take the ends of the Himos to the inside of Do. 15. 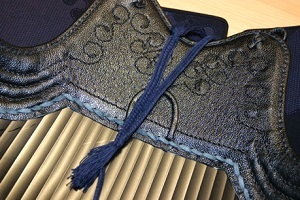 Place the Tare & Do compo to the bogu bag. 16. 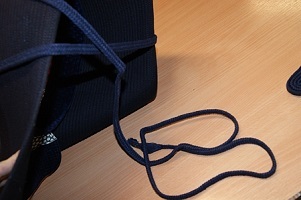 Place the Men and Kotes to the bag. 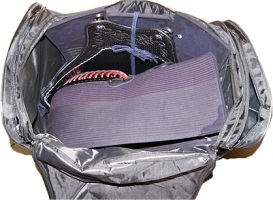 Remember that you do not need to fold the Men Tares (side flaps of the helmet) to fit the Bogu inside the bag. 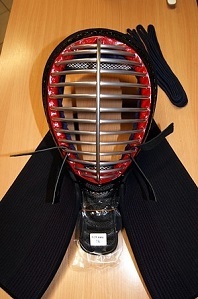 Folded Men Tares will stay too open and not protect against Tsuki or hits to shoulders.